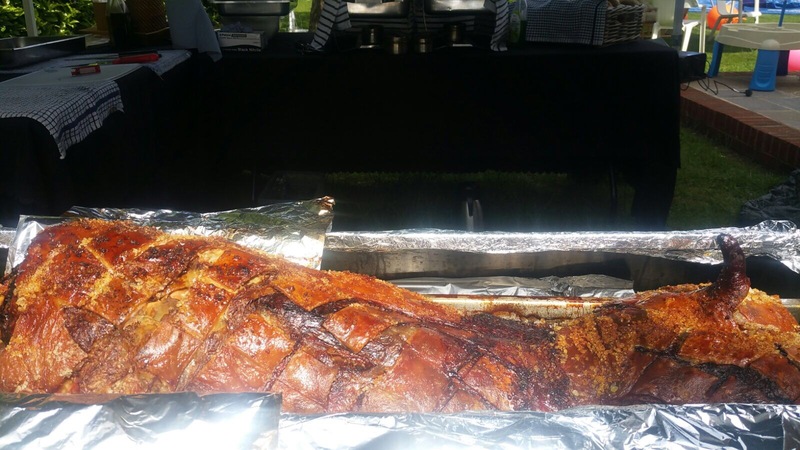 As party and event caterers, our team at Hog Roast Pensford constantly cover so many different kinds of private parties throughout the year, including birthday celebrations, christenings, stag and hen parties, Christmas and Bonfire Night events, and so much more. We recently catered a lovely kids’ party over the Easter weekend, and once the egg hunt was over, more than 40 guests would settle down to enjoy our delicious hog roast rolls and salads before feasting on chocolate eggs provided by the host, Sally. When Sally booked us in several weeks ago, she had been recommended to us by a family friend. She’d never had caterers for an Easter party before but there’s a first time for everything, so we let her know about all our different options and she was more than happy to have us prepare our famous pigs in buns. On the day of your party, we bring along a whole local pig and prepare it from scratch, then roast, carve and serve it to you and your guests while hot and fresh. After slicing off bits of salty crackling and slices of tender pork, we cram them into fresh bread rolls along with our homemade duo of apple sauce and sage and onion stuffing. We always provide condiments too, as oftentimes there’s nothing better to top off a Hog Roast Pensford roll than a dollop of ketchup. When Hog Roast Pensford arrived at Sally’s house on Sunday, we set up our equipment in the large back garden as it was being decorated by family members and as Sally was hiding the eggs for the hunt. The decorating soon paused though when we began to prepare the meat to be roasted, as it always seems to attract a crowd (just like the smells do once it’s cooking away). Once done, after we explained the preparation and cooking process to the family, we just had to keep an eye on it while the meat roasted. 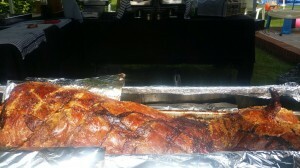 A few hours later and we could see the sight and smells of the hog were making the hungry guests lick their lips in anticipation. While the kids looked for the hidden Easter eggs, we freshly prepared the salads and sliced the bread rolls, ready to stuff them and to satisfy the guests’ hunger. Cross Fit Hog Roast In Longford.